Marc Morial calls for New Civil Rights Movement (National Urban League Photo by Lawrence Jenkins). 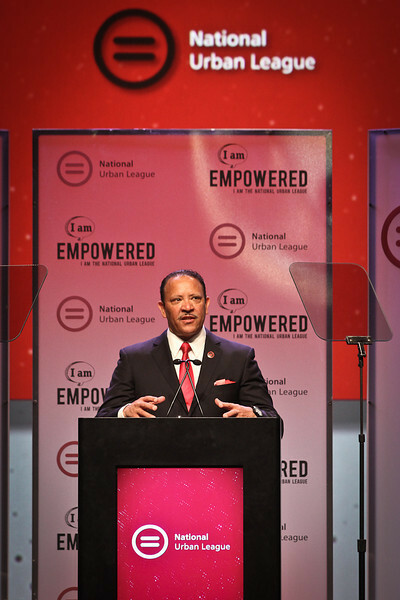 PHILADELPHIA (NNPA) – National Urban League President Marc H. Morial has called for “a new civil rights movement,” one that will focus on economic empowerment and justice. Morial, now in his 10th year as president and CEO of the nation’s second-oldest civil rights organization, announced his proposal last Wednesday nights at his group’s annual convention here. With a March on Washington planned for Aug. 24, the National Urban League leader said just as Blacks have fought for basic rights in the past, such as the right to vote and have full access to public accommodations, African-Americans are now in another fight to preserve those gains. ”I was saddened as most of you when the verdict was announced. I’ve said it before, and I will repeat it here – with the not guilty verdict in the trial of George Zimmerman, the tragedy of Trayvon Martin’s death has become a travesty and miscarriage of justice. We must accept the jury’s decision under the due process of our legal system. But we have made it clear that this is far from over” said Morial, an attorney and former mayor of New Orleans. Some conservative commentators have accused civil rights leaders of being concerned when a Trayvon Martin is killed by a George Zimmerman, who has White and Latino lineage, but not when Blacks kill other Blacks. Morial said conservatives are misstating the facts. ”I am outraged when Black teens kill Black teens or when gangbangers take the lives of another gangbanger and all too often, innocent bystanders. I am outraged at the violence that has taken far too many of our nameless, faceless and now forgotten young people…whether in Philadelphia, Chicago, Baltimore, New Orleans or any other city,” he stated.